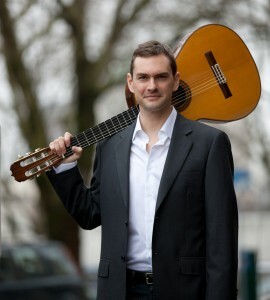 Allen Mathews is a solo classical and Brazilian guitarist in Portland OR, USA. Allen Mathews is a guitar player that currently resides in Portland, Oregon. He specializes in classical, Spanish, and Brazilian music and he has been welcomed as a performer in 6 countries, and throughout the US. Aside from performing, Allen Walter Mathews has a B.A. in Guitar Performance from Fort Lewis College in Durango, CO, and has learned from many fine musicians in the US and Brazil, where he lived for a time. According to the website: Mr. Mathews teaches guitar at Reed College and Oregon Episcopal School in Portland, and has a private teaching studio in southeast Portland which also offers online lessons via Skype. For three years he headed the classical guitar department at Lewis and Clark College. He has been a guest instructor and clinician at colleges and universities around the country.